Today’s trip was very close to home as we explored ‘Old Tel Aviv’ and learned about the incredible story of the establishment and development of the city I now call home. 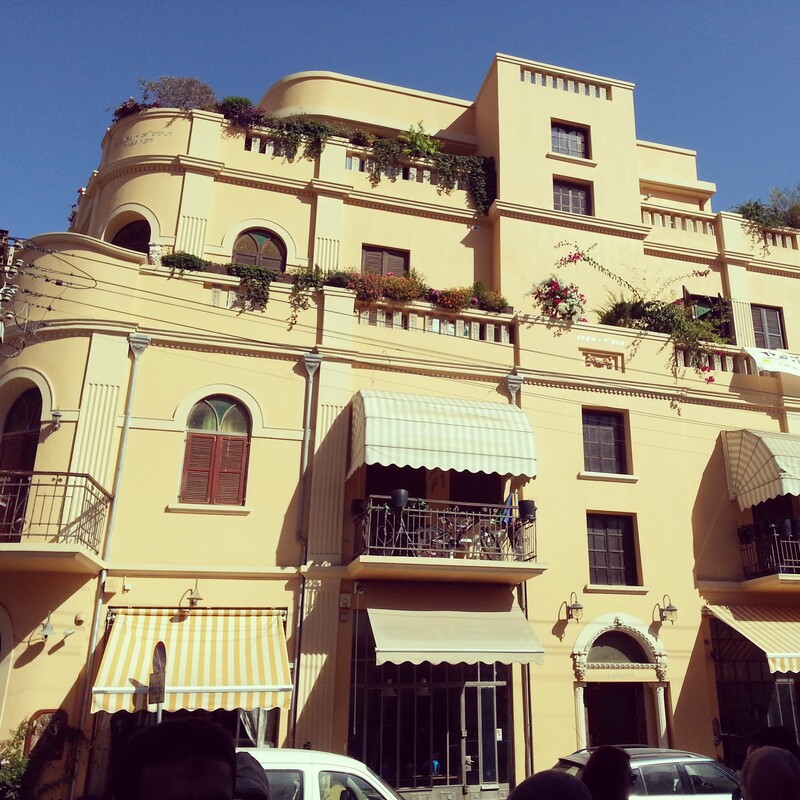 However, we actually began the trip in Jaffa. Why? Arguably, without Jaffa, there may have been no Tel Aviv. As the main port into the area, the vast majority of Jewish immigrants arrived in Jaffa as their gateway into the rest of Israel. With the immigration numbers increasing in the 19th century, some Jews decided to put down roots in the city, and a small Jewish quarter was created. As Jaffa began to get more and more crowded, and conditions less and less sanitary, people began to move out of the city walls, with Arabs mostly moving to the South and Jews founding the area of Neve Tzedek under the patronage of Aharon Chelouche. En route to Neve Tzedek, we stopped first in the American Colony, and heard the sad story of the community from Maine who arrived here in the 19th century only to suffer terribly from poor sanitation and malaria. They lasted less than a year before most of them returned home. They sold their properties to the German Templers who made this their second settlement after Haifa, and managed to make a big economical success out of it by turning it into an area of hotels for Christian pilgrims arriving from Jaffa. German efficiency for you. Finally arriving at Neve Tzedek, we learned more about its development, although at the time they considered themselves part of North Jaffa rather than anything else. The reasons for moving were practical rather than ideological, although many early Zionist ideologues, thinkers and writers ended up living there including Yosef Haim Brenner, Agnon, Devorah Baron and Rav Kook. 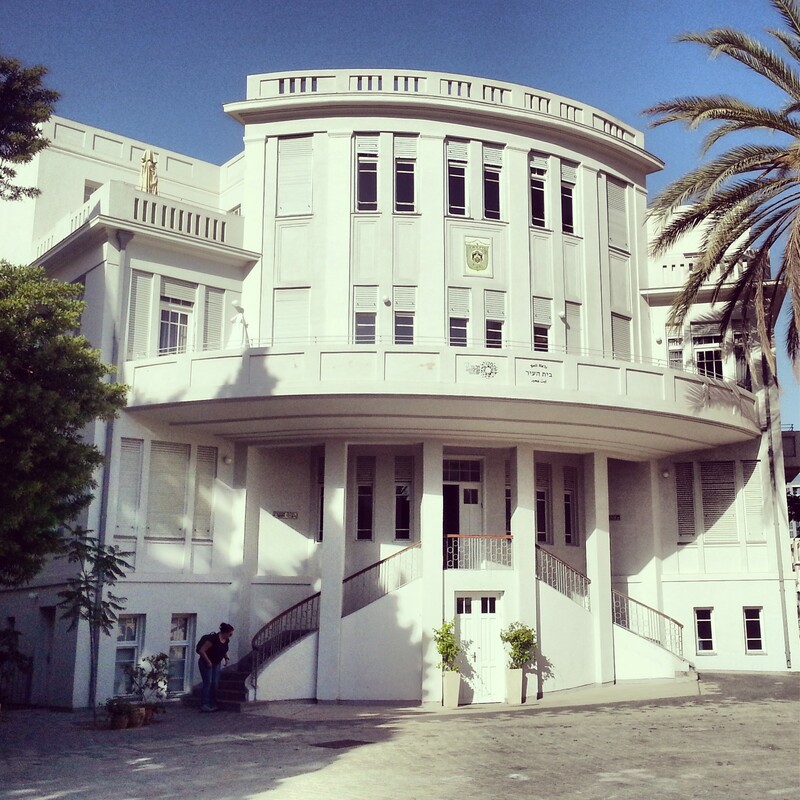 We continued towards Rothschild Boulevard and entered the Shalom Tower, built on the previous site of the Herzilya Gymnasium, the first Hebrew school. I have been in the tower a few times but never noticed the large exhibitions about the history of Tel Aviv. Here we learned about a small group of people, led by Akiva Weiss, who left Jaffa, and went even beyond the new neighbourhoods of Neve Tzedek, Neve Shalom and the Yemenite Quarter to establish a new, Hebrew speaking settlement called Achuzat Bayit. 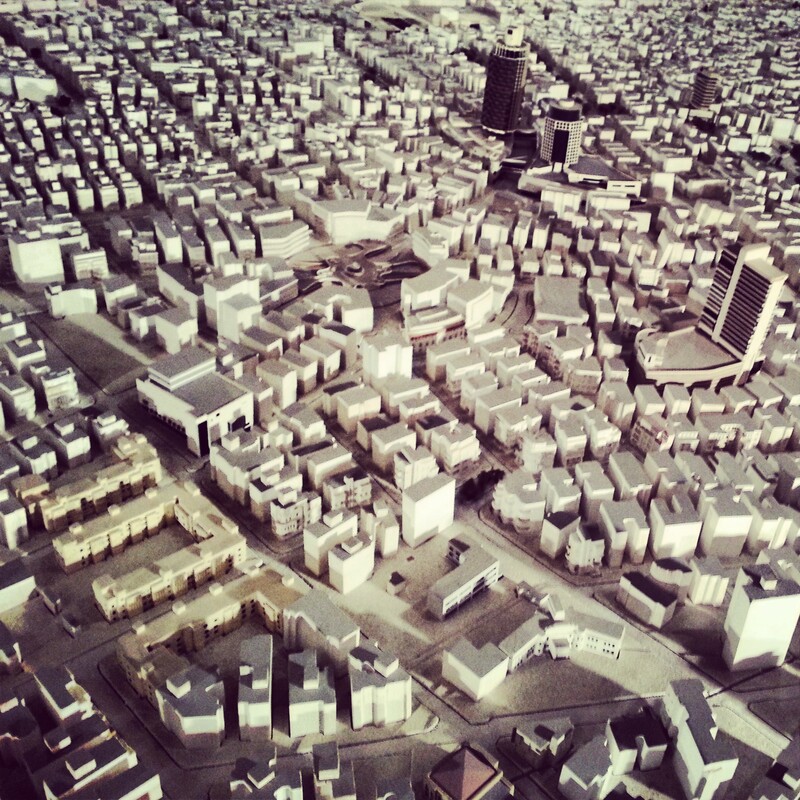 The small group of around 60 families were ideologues, looking to build a new modern city. They had wide roads, running water in their homes, an electric street lamp and spacious gardens. The city was soon renamed Tel Aviv and over time became the cultural and economic centre for the Zionist movement. There was an exhibition on architecture and we learned about the ‘eclectic’ style that was used in the 1920s and the evolution into the ‘international modernist’ style, which is mostly known now as Bauhaus architecture. In fact, we learned, Bauhaus was a design school, influenced by the international modernist movement, which taught architecture among other things. 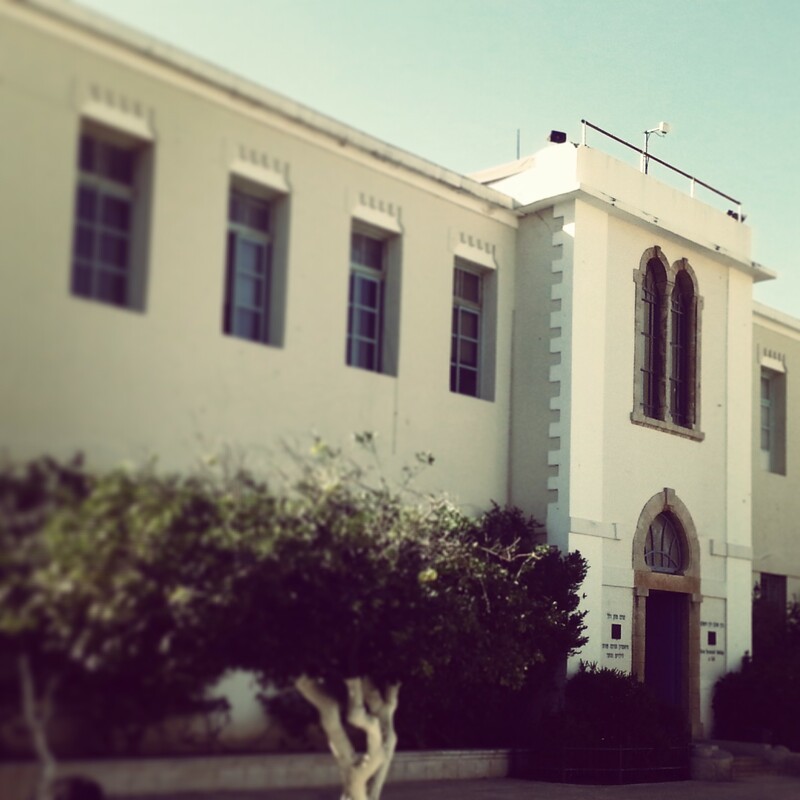 When Hitler closed it down several of its former students moved to Tel Aviv, influencing the buildings. UNESCO deemed this worthy of making the city a world heritage site, known as the White City; the international modernist movement with its clean, functional design marked an important turning point in the history of architecture, but in most cities where you can find it exemplified there are one or two buildings dotted around. As Tel Aviv was a new city, it is the only place where this architecture really is everywhere. 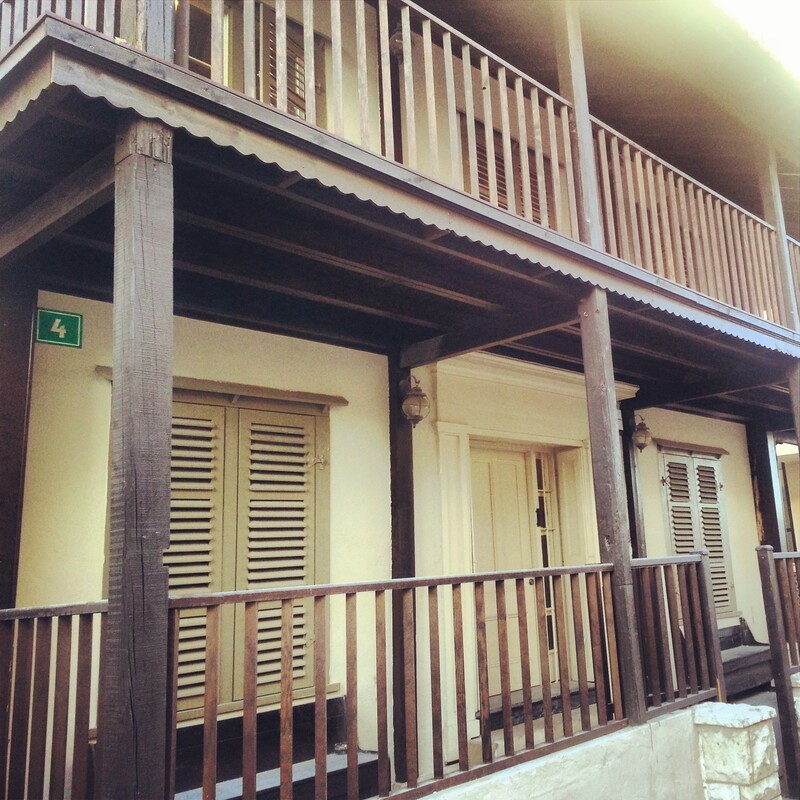 We headed back to Rothschild and the former home of the first mayor, Meir Dizengoff. 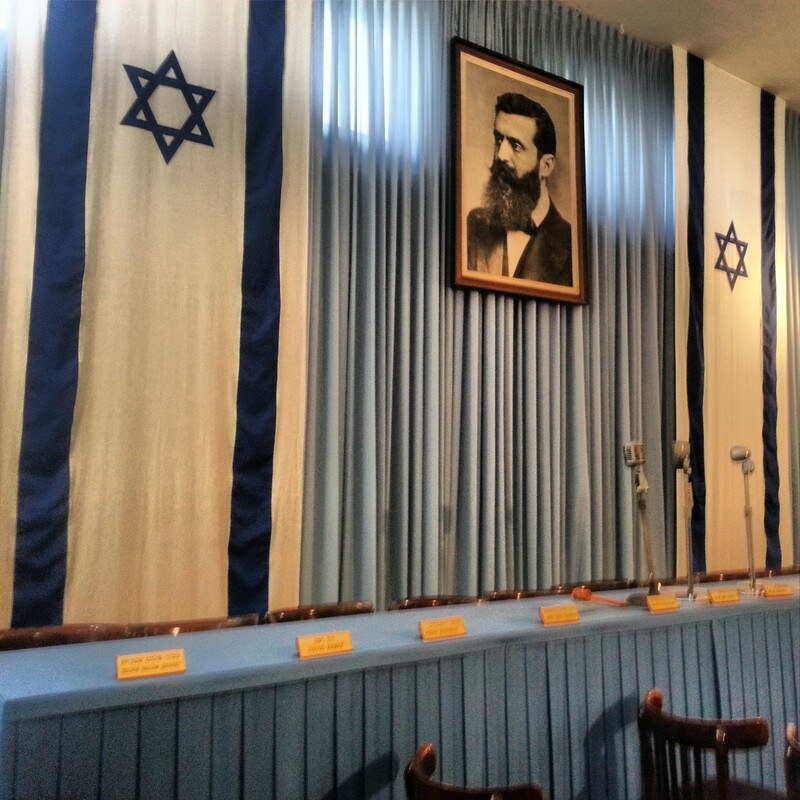 In 1948 this was the site of the Israeli declaration of Independence, and it is now a museum commemorating that momentous event. I have been to the Independence Hall a few times and it never fails to get the heart racing. The story leading up to the declaration is, frankly, incredible; both in terms of the long term story and the immediate events of the declaration (for example, the guy with the declaration couldn’t get a taxi to the event and had to flag down passing cars to arrive on time). I love going back there, sitting in the hall and listening to the recording of the declaration. We returned to Rothschild and wandered down the boulevard, our guide pointing out various buildings of historical interest. We then walked up to Bialik St, passing the former homes of the famous artist Rubin and the national poet Bialik, whose home gives the street and the square at its end their name. 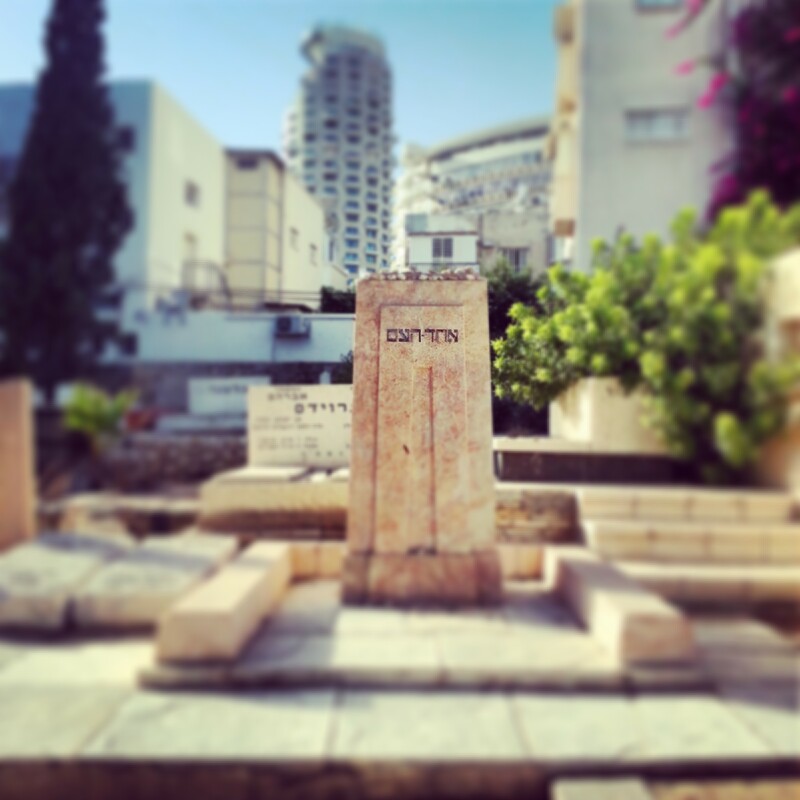 After a brief stop in Gan Meir, we walked to the Trumpeldor cemetery, built at the time by Chelouche of Neve Tzedek fame at a suitably distant location from people’s homes – he was sure the houses would never reach this far….now it is bang in the city centre! The cemetery contains the final resting places many of the great names of Zionist history: writers and thinkers such as Brenner, Ahad Haam, Bialik, Nordau, Baron; activists such as Sharett, Dizengoff, Golomb, Dov Hoz. People are still buried here and we saw the grave of the great singer Shoshana Damari. She sadly died penniless but her artistic friends clubbed together to buy her a plot in this cemetery. We heard the stories of many of these founding fathers/mothers of the Israeli state, together with the sad story of the riots in 1920-1 in Jaffa which led to several deaths – some were buried in a mass grave; Brenner was also killed in the riots and can be seen separately. Our final stop of the day was at the Opera Towers, at the end of Allenby. I was surprised to learn that here was the site of the first Knesset (the Israeli parliament) before Ben Gurion moved it to Jerusalem. If you enter the shopping centre, you can see a picture there of the Knesset in session. A great time was had getting to know my home city and now I have plenty of information with which to entertain family and friends on their visits! This week, a later start (meeting at 8am, an extra 90 minutes of sleep!) as we were not leaving the confines of Tel Aviv. 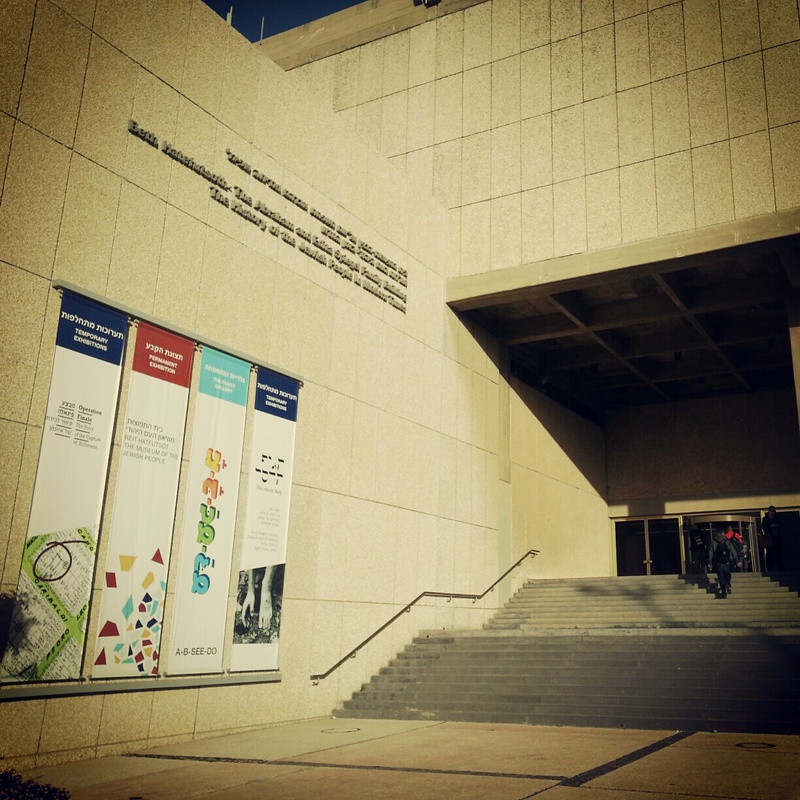 There are many museums in the city and several of them are concentrated around the university campus, located close to the northern suburb of Ramat Aviv. Today, we would be visiting some of these sites, partly to bed in some of what we have been learning in the classroom, and partly because these are important sites for us to be able to guide in the future. The day began at the Zoological Gardens. 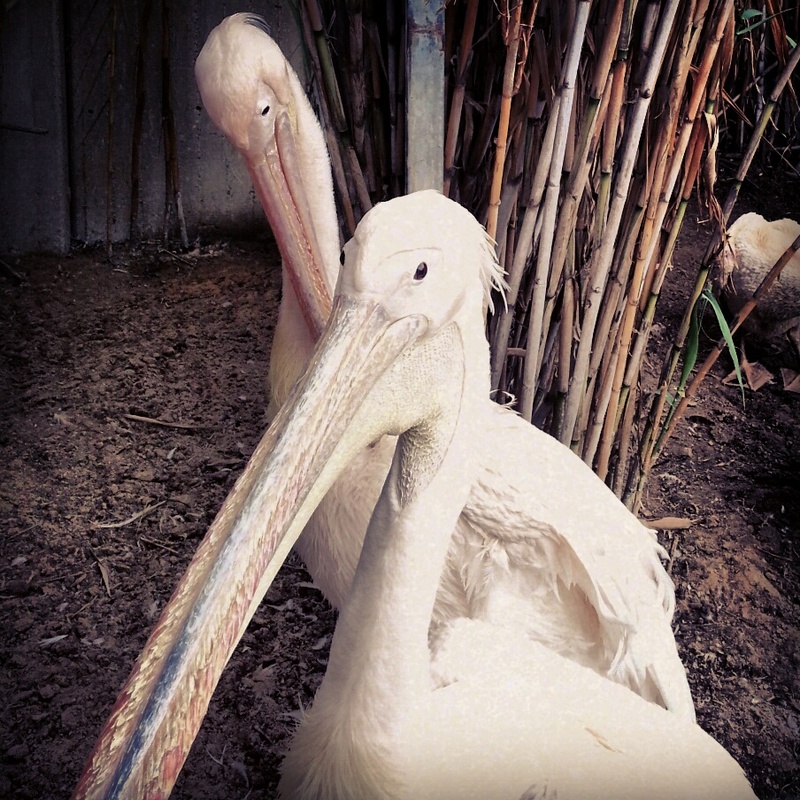 Having studied Zoology in class, this was an opportunity to get relatively up close and personal with the various species of bird, mammal and reptile found in Israel. Our guide, a PhD student at the university, took us around the various enclosures, showing how the animals camouflaged themselves in their environment, explaining about their hunting or survival techniques and their distinguishing features. There was a huge range of animals (as might be expected in a Zoological garden). The most interesting were those you don’t normally get to see up close; the wolves, hyena, wild boar and wild cats. Also the snakes. Although I don’t like snakes. And there are quite a few poisonous ones in Israel, it turns out. The advice was: a black snake in the centre of the country is not poisonous, a black snake in the South is likely to be either a black python or mole viper, and these are definitely best avoided. I’m not a big fan of snakes, truth be told. I was happy to return to the flamingos. Got to love flamingos. Apparently they are not pink naturally; it’s to do with the way their bodies break down the enzymes in the algae they eat. And they only mate when they’re in a big group (so the garden has mirrors around it to try and persuade them that they are more numerous than they actually are). After a good dose of fauna it was time for some flora; the Botanical Gardens were right next door and we headed over to meet our Botany teacher. Again, it was a case of seeing what we had learned in the class, in the field. 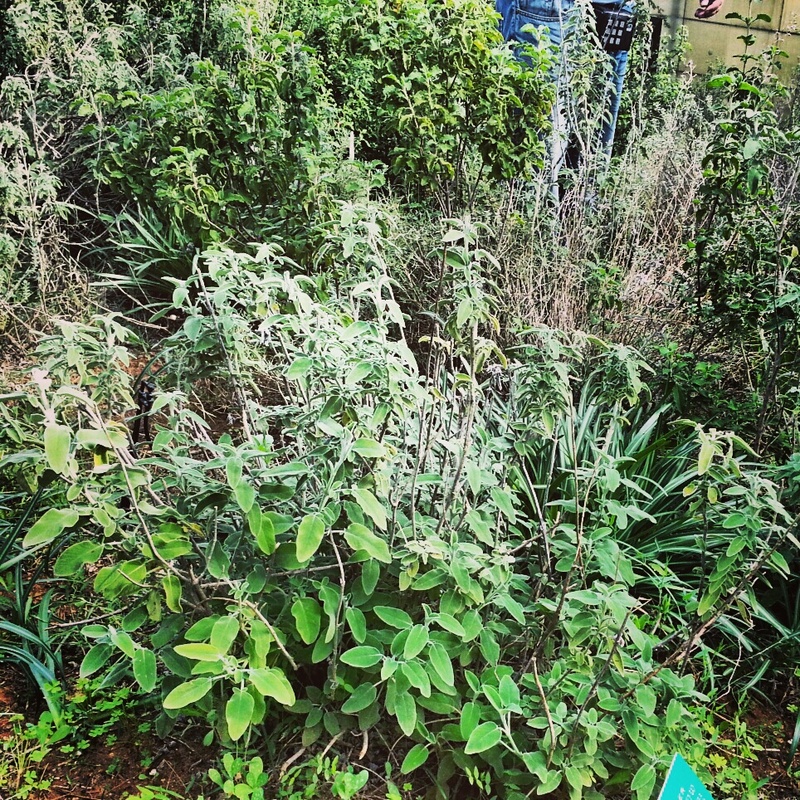 It’s one thing to see the plants, but also interesting to hear some of the stories and legends behind them. The Hairy Thymelea (I kid you not) is considered to be the plant that Samson was bound with when he was captured by the Philistines. The appropriately named Christ’s Thorn Jujube is thought to be the plant that was used to make Jesus’s thorn crown. And the Judas Tree has a pink blossom because it is embarrassed by its treachery. 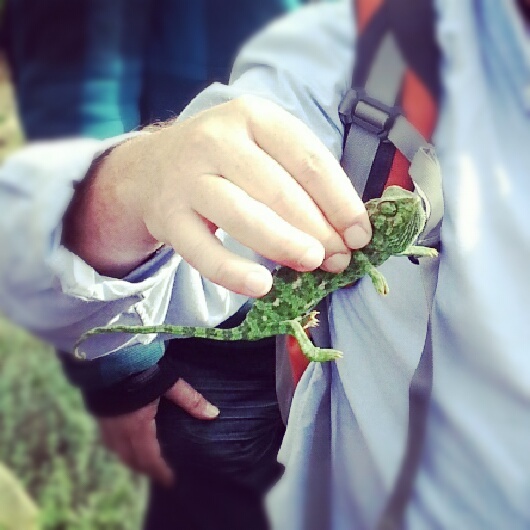 Most fun was when our guide spotted a chameleon in the bushes and proceeded to lift it up and show it to us while telling us that we should never do such a thing. So, we got in a little bit of Zoology in the Botanical Gardens too. We enjoyed a lunch break strolling around the university campus (where there was a lunchtime rock concert…a hard life these students lead) and then it was time to visit the Palmach museum. The Palmach was the elite force of the Haganah, the pre-state defence force for the Jewish population of the British Mandate; many of its members played very important roles in civilian life, most famously Yitzchak Rabin and Moshe Dayan. In addition to learning how to fight, they also had to work the land. Hence the emblem of the unit had a sword together with two ears of wheat. The museum is a walk through experience which follows the story of a group of Palmachnikim who join the unit and end up playing an important role in the War of Independence several years later. Unlike many museums there are no displays or exhibits, rather one moves through rooms and watches, hears, sometimes even smells the story of the Palmach through the eyes of this small group. It really is an amazing story; teenagers as young as 16-17 signed up and trained themselves with very limited weaponry; they then played an important role in defeating the five armies that invaded Israel when it declared independence, although sadly many of them died along the way and they are remembered in a touching memorial at the museum’s end. The museum is in Hebrew but a headset providing an English translation is available. Our final stop of the day was the Diaspora museum which is actually inside the university campus. 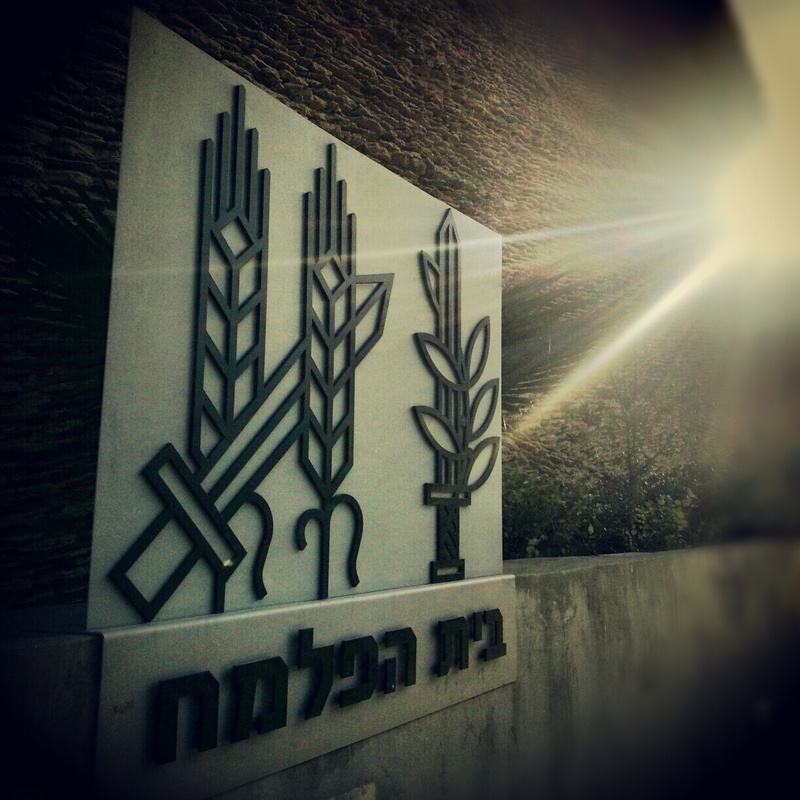 Founded in the late 70s by Nachum Goldmann and Abba Kovner, the museum was designed to answer the question of how the Jewish people managed to (largely) maintain their religion and culture in 2000 years of exile. Sadly, the museum seems a little dated; it seemed much the same as I remember it from 10 years ago and has not taken advantage of the advances in technology and museum design. But it still provides a good introduction to Jewish life, ritual and rites of passage; insights into communities outside of Israel and perhaps most interestingly, a collection of model replicas of synagogues from around the world of historical significance. Although I felt that Bevis Marks, the oldest synagogue in Britain, should probably have been featured, and wasn’t. Which hurt my national pride a little. Still, it is an important museum, I remember that my visit to the museum was the first time I really heard in detail about Jews who were from a radically different background to mine (the UK community is quite homogenous). And it’s quite amazing that despite being so spread out over such a long period of time, the core aspects of the religion remained the same everywhere. And on that positive note, it was time to head home.